Named to honor America's famous glass artist, Dale Chihuly. This rose has it all, impeccable style & an ever-changing array of flashy colors. 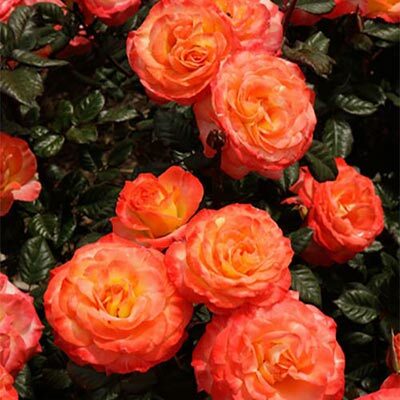 As the sun hits the opening petals, they blush from subtly-striped apricot yellow to dazzling orange & deep red…producing a remarkable display against the deep dark green leaves & mahogany-red new growth. Larger flowers in cool conditions.